National League matches between Wrexham and Chester will be all-ticket in the coming season. The teams meet in Chester on 3 October this year and at Wrexham's Racecourse Ground on 19 March, 2016, with both matches kicking off at 14:00. Fans will not be able to travel independently to away matches, but only on officially organised coaches. The decision follows a meeting between the clubs, Cheshire Police and North Wales Police. The clubs' fans have a long-established rivalry, and this is the third consecutive season that the restrictions will have been in force. A joint statement by the clubs and both police forces said the conditions would be enforced for the safety of fans and to avoid potential disruption away from the football grounds. 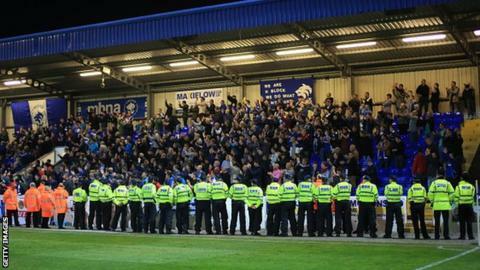 It added that there had been a reduction in arrests and disorder in recent seasons, but acknowledged there had been some damage caused by a "small minority of Chester supporters" at the last match between the clubs in Wrexham. However, Chester FC had agreed to reimburse Glyndwr University - who own the Racecourse Ground - for the damage caused. Wrexham have been allocated 1,200 tickets for the match in Chester.